Here is part two of an eye-opening article on a much misunderstood subject. We have been asked, "Wasn't tithing just for the Jews of a long-dead past?" Or, "Was it a form of national taxation in ancient Israel?" Or, "Was it to supply material needs to the poor?" 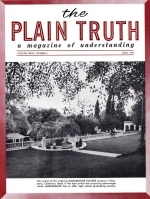 You'll find the answers in this article, continued from the February issue, enlightening, plain! Is "tithing" obligatory in NEW Testament times? Or has God left us to our own devices – for churches to resort to the old-fashioned oyster supper and ice cream socials, or to bazaars, entertainments, dances and church movie shows to raise money? How should God's work be financed? Does God have a definite system?